Property Size 760 sq. ft.
- Pool, Jacuzzi & tennis access at the Sundance Club. * Please note The club hours will change to 11 am to 8 pm on September 4, 2018. The last day the club will be open for the summer season is September 30, 2018. The club will re-open Thanksgiving weekend for the winter. The deck extension project will begin Tuesday, September 4, 2018. During the construction, the tennis courts will be closed. The pool will be open late evenings from approximately 5:30 pm to 8 pm on weekdays and from 11 am to 8 pm on weekends. The hot tubs and locker rooms will be open during construction. The Allure Chalet is a two bedroom, two bath condo with a modern decor unique to the Tensleep Rentals. Upon first entering this unit, guests are greeted with a bright, contemporary atmosphere and a creatively-executed renovation utilizing natural stone tile, elegant fixtures, and refined furnishings. Modern art accents and a bold color palette further complement the well-designed feel of the property. Less than a minute's walk from the property is the Sundance Swim and Tennis Club, to which our guests receive complimentary access. The club hosts a large heated pool, both a family and adult Jacuzzi’s, a small children’s pool, and tennis courts. The club also features a communal BBQ area with plenty of tables and spacious seating. Please see the Sundance Swim and Tennis Club website at www.sundancetennisswimclub.com for hours of operation and seasonal closures. Any trip to Jackson Hole should be one to be remembered. Enjoy the epic landscapes, the stunning National Parks, the abundant recreational opportunities, and the added amenities at the Sundance Club with a stay at the Allure Chalet. From the shared parking area you’ll reach the unit after walking up a short staircase (five steps) and taking a right on the wood-framed walkway. Upon entering the unit, you’ll find yourself in the living room with seating and an HDTV to your right, and the dining table and kitchen straight ahead. Past the living room are both bedrooms. The master bedroom/master bath sit between the second bedroom and a shared bathroom. The second bedroom door opens near the living area with a hallway leading to the shared bathroom. Master Suite - Featuring a queen-sized bed topped with a stylish comforter and overstuffed pillows. The room offers sleek furnishings and an attached master bath. Bedroom Two - The second bedroom is equipped with two twin-sized beds and upon request they can be converted into a single king-sized bed, allowing this room to be utilized by children or adults. Bathrooms - The master bath was added as part of the renovation, along with the addition of porcelain sinks, water-saving toilets, modern lighting fixtures, and chrome faucets. Additionally, large, glass-encased walk-in showers were added and tiled with natural stone. Kitchen & Dining - Prepare your meals in style in the Allure Chalet’s stunning kitchen, which boasts a daring, deep-red glass tile backsplash and elegant stainless steel appliances. The dining table seats six and provides ample room to spread out and entertain. 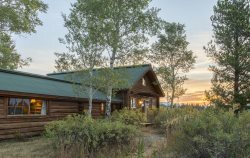 The Allure Chalet is located in the resort town of Teton Village, less than a mile from the US 390 highway, five miles to Grand Teton National Park, 60 miles to Yellowstone National Park, and 12 miles to the town of Jackson. Stay in the heart of Teton Village and enjoy hiking, biking, skiing, dining and nightlife all within walking distance. When you’re ready to explore the National Parks, Teton Village is conveniently located just five miles from the Granite Canyon entrance to Grand Teton National Park, providing quick access to the Phelps Lake and Death Canyon trailheads. Additionally, our guests are right at the base of Jackson Hole Mountain Resort which hosts an aerial tram all year long, hoisting its passengers to the summit of the mountain for breath-taking 360 degree views. Depending on the time of year and your appetite for adventure, you can even choose to hike or ski your way back down! Jackson Lodging Co. provides some essential items one may need for their stay. We place linens and terry in the unit, which are washed with Green Seal-certified detergents. Toiletries (shampoo, conditioner, lotion, mouthwash, a grooming kit, toilet paper, and Kleenex), dish soap, sponges, trash bags, etc., are provided for your use at no additional charge. Kitchen amenities, other than coffee filters, are not provided. There may be items such as spices, ketchup, salt, and cooking oil at the property that have been left from previous guests. This condo is cleaned with Green Seal-certified products for your health and the environment. Upon your arrival please review the guest book as there are important details on check-out procedures and all the amenities the property has to offer.